The Martians are coming to San Diego in July. Sorry, Padres fans, but they're not going to abduct Cameron Maybin and his pitiful batting average. 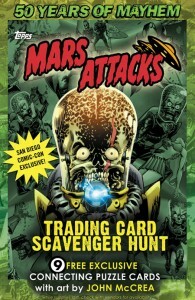 Rather, Topps is producing an exclusive nine-card Mars Attacks promo card set for the 2012 San Diego Comic-Con. The nine cards fit together to form a puzzle. It features artwork from John McCrea, the artist working on the Mars Attacks comic book for IDW. Like most Comic-Con swag, supplies are limited. The promo cards coincide with the release of 2012 Topps Mars Attacks Heritage. The 2012 San Diego Comic-Con runs July 11-15.